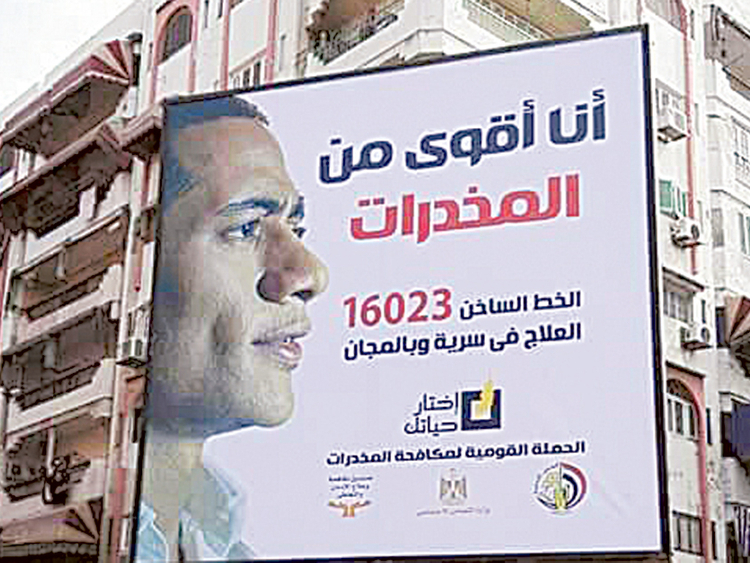 Cairo: “You have a dream. It needs patience and persistence,” says Egypt’s famed footballer Mohammad Salah in a video footage, addressing his young compatriots. “You may fall. But don’t surrender. Say yes to everything that’ll fulfil your dream and no to anything that’ll stop you,” the player of the Italian club Roma adds as the video alternately features him on the pitch and youngsters from his home country. “You’re stronger than drugs!” the 23-year-old player declares. In the past few days, this 70-second video has been shown on Egypt’s local television stations and social media, generating strong interest among Salah’s wide fan base in the country. The footage is part of a high-profile campaign launched by the government to fight drug addiction, mainly among youngsters. Around five million of Egypt’s 90 million population are drug addicts, according to official figures. The anti-drug drive is based on participation of Egypt’s stars who are popular with young people to help in curbing drug use, seen as a main cause of domestic violence, street sexual harassment and road crashes in the country. “For sure, stars like Mohammad Salah will get ears from his young fans when he advises them to avoid taking drugs,” said Sharif Fawzy, a specialist at a private drug rehabilitation centre in Cairo. “He is seen as a role model for many Egyptians as he has achieved world fame through his football skills. For many youth in Egypt, he is an embodiment of the idea of overcoming obstacles through determination,” Fawzy told Gulf News. Salah, a native of the Gharbia province in Egypt’s Nile Delta, has said that he volunteered to appear in the anti-drug video as part of a series of planned advertisements to raise awareness among his young compatriots about the drug problem. “This is a national work to protect youth from the danger of drugs,” Salah, nicknamed the Pharaoh, added in an online statement. As part of the anti-drug campaign, young film actor Mohammad Ramadan, hugely popular with teenagers, has also appeared in another video, titled “I’m Stronger than Drugs”. The 27-year-old actor is famed for starring in box office thriller films. “Several surveys on youngsters aged 12 to 18 years have confirmed that Mohammad Ramadan has a big influence on youth,” Minister of Social Solidarity Ghada Adel. “He has participated in the video for free out of his belief in the dangers of drugs and to help expose wrong concepts about them,” she told a recent seminar in Cairo. Eleven ministries and several civil society groups are joining the anti-drug campaign, which includes a preventive programme launched at 2,000 schools across Egypt. The campaign also features “A New Beginning”, a programme designed to incorporate ex-addicts into society by assisting them to start their own business with state loans. The Ministry of Waqf (religious affairs) has instructed mosque preachers to address perils of drugs in sermons in this mostly Muslim country. “There are wrong concepts among young people who take drugs,” said Amr Othman, who heads the governmental Fund for Combat and Treatment of Addiction. According to him, 29 per cent of young drug users think that the illicit stuff make them bold; 36 per cent use drugs in the belief it enables them to achieve social acceptance; and 35 per cent say it helps them overcome depression. Othman said that videos featuring Salah and Ramadan have led to positive results. “The participation of both stars has helped the calls, received on the hotline set up by the Fund for requesting treatment for drug use, to increase by around 82 per cent,” the official told Egyptian television.